By definition, “sustainable” means to create and maintain conditions under which humans and nature can exist in productive harmony. More simply, “sustainability” means meeting today’s needs while conserving the resources needed for tomorrow. Due to the intensive application of best management practices, the hardwood forests of the United States support a vibrant healthy stand of timber, as well as a large and diverse wildlife population, clean rivers and streams, and a host of recreational activities. And since there is twice as much American hardwood growing than is being selectively harvested annually, it is clear the hardwood supply for future generations is sustainable. American hardwoods have a low impact on the environment at all stages of their life cycle right from the point of extraction. Over the last 50 years, throughout the U.S. there has been a 39% increase in the amount of wood and paper products produced per cubic meter of wood input. Between 1953 and 2007, the volume of U.S. hardwood growing stock more than doubled from 5 billion m3 to 11.4 billion m3. Hardwood growing stock volumes have continually increased for the past 50 years, even in times when timber harvesting was most intensive. Forests are aging and more trees are being allowed to grow to size before being harvested. The volume of hardwood trees with diameters 48 cm or greater has tripled from 731 million m3 to 2.3 billion m3 since 1953. Each year for the past 50 years American hardwood forests stored around the equivalent of 165 million tonnes of carbon dioxide. Because they are untarnished by mixing with other materials and chemicals, American hardwoods are readily reusable and recyclable at the end of a building’s lifespan. Forest management in the sector is not intensive, one outcome of the fact that most U.S. forests are owned and managed by individuals, families or small companies rather than large timber corporations. Approximately 80% of U.S. forest land is privately owned by about 10.4 million landowners, with an average holding of 10 hectares (25 acres). 27% of U.S. timberland consists of public lands and national forests, while only 14% is owned by the forest industry. U.S. forest holdings are relatively small, mostly under 10 hectares, limiting the size of harvesting operations. The primary motivation for owning ‘forest land’ in the U.S. is usually not timber production or economics, but simply the enjoyment of forest ownership. U.S. hardwood is recommended for chemically sensitive individuals, or those who suffer from allergies or asthma. The U.S. hardwood industry bases sustainable design on ethically sourced materials extracted and manufactured in a way that supports human rights and basic needs such as sufficient pay, healthcare and benefits. Independent studies show that there is a very low risk of any U.S. hardwood being derived from illegal sources or from forests where management practices lead to deforestation or otherwise threaten biodiversity. U.S. hardwood is recyclable, biodegradable and durable – sometimes lasting for centuries. When it is no longer needed, it can be returned to the earth and renewed for future generations. Sustainability is about smart business — using more efficient production methods to reduce inputs while increasing yields and food quality. U.S. forest product exports have grown 80% over the last five years. The U.S. hardwood industry maintains a steady share of the growing global market at just over 10%. The U.S. exported a record $9.7 billion of forest product in 2014. In the U.S., forest products companies employ 1.75 million people and are ranked among the top ten employers in 40 states. The average single-family home in the U.S. contains more than 13,000 board feet of lumber, and 94% of all new homes are built with wood frames. Sustainable Forestry. 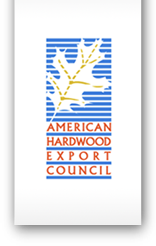 American Hardwood Export Council. Updated 2015. Available at: www.americanhardwood.org/sustainability/sustainable-forestry. American Hardwoods: An Ecological Success Story. Frank Miller Lumber Company, Inc., 2011. Fact Sheet: Are American hardwood forests sustainably managed? American Hardwood Export Council, 2015.